Featuring the rich history of Ipswich's Eastern Suburbs including Goodna, Gailes, Camira, Bellbird Park, Augustine Heights, Brookwater, Springfield, Redbank Plains, Redbank and Collingwood Park. Goodna resident Dot McGreevy and Ipswich Councillor Paul Tully admire the historic home at Queen St Goodna which once hosted Hollywood entertainers. THE childhood home of cinema mogul Edward Carroll has been identified as a place of historical significance to Ipswich. The Queenslander, built in 1906 at 16 Queen St, Goodna, will be marked with an Ipswich City Council historical plaque to encourage its conservation. Carroll, of Birch Carroll and Coyle cinema fame, lived in the Goodna home with his brother Dan and teacher parents. The boys grew up to co-own local theatres and screened silent films in Brisbane and Ipswich in the early 20th century. Carroll achieved fame when he partnered with Birch and Coyle to build some of Queensland's first cinemas in the 1920s. They built the first cinemas in Ipswich and Rockhampton before expanding across Queensland. Over the years, the family hosted many famous entertainers at their Goodna home, and became well-known for their large parties and dances. Current owner Dot McGreevy said she was surprised to learn that Scottish entertainer Harry Lauder had visited the house. "They always had famous violinists, singers and pianists over, but to hear Harry Lauder stayed here was very exciting," Ms McGreevy said. "We bought the house not knowing anything about its past, and the neighbours used to tell us all these amazing stories. "Apparently Harry Lauder came to a party here one night and burst out in song. "It's a very nice, ordinary home, so you wouldn't suspect a thing about all those ballroom parties and big, glamorous events." Planning and Development Committee chairman Paul Tully said council launched the historical marker project in 1999 to promote public awareness of historic sites. "Through these markers we are providing a permanent and enduring way for the memories of the past to be kept alive," he said. Former Blackstone Congregational Church, 14 Mary St, Blackstone. Built in 1879. Rhossilli, 4 Glebe Road, Newtown. Originally a dairy farm, now a family residence. Chasely, 51 Salisbury Rd, Eastern Heights. Built in 1908. This rare archival film footage (without sound) has just become available. It shows a Special Meeting of the Ipswich City Council in 1960 to celebrate Ipswich's 100th anniversary of its proclamation as a municipality in March 1860 by the Governor of Queensland. In 2010, Ipswich proudly celebrates its sesqui-centenary - 150 years of municipal government in the city. Ipswich was the first municipality in Queensland established by the new Queensland Government following separation from New South Wales in December 1859. DO YOU HAVE ANY RARE FILM FOOTAGE OF THE IPSWICH REGION? CURRENT and former staff of St Francis Xavier's School, Goodna, took a trip down memory lane as they celebrated the centenary of the school recently. About 60 people enjoyed a night of fun and memories as they gathered at the Goodna RSL function centre for a staff reunion dinner. Master of ceremonies and former teacher librarian Glenda Hogg acknowledged guests and shared stories as past principals and staff entertained the group with anecdotes that kept the festivities on track. Ms Hogg, who worked at the school for 25 years, was a great source of memories. Tables were awash with the school's colour of blue, with accents of silver, and many gasps, sighs and chuckles could be heard as guests were treated to a slide show. A highlight of the night was the trivia competition on the history of the school, which kept everyone talking. Current staff member Brenda Reynolds said she was "ecstatic to mingle with former colleagues and catch up with friends from times past on such a wonderful evening". 2010 marked the 100th anniversary of the opening of the school and the staff reunion dinner was the first of many celebrations. Events to look forward to included the opening of the new school buildings and the creation of a school mural. of the new Mayoral chain of office. Paul Pisasale is the 49th Mayor of Ipswich. A special re-enactment of the first Ipswich Council meeting on 12 April 1860 occurred in Ipswich tonight. The current mayor Paul Pisasale and councillors re-enacted the roles of the first mayor John Murphy and the other aldermen. The main item of business was to appoint a Town Clerk on an annual salary of 200 pounds. A large crowd was in attendance at the Ipswich Civic Centre including the great, great grand-daughter of the "Father of Ipswich" - George Thorn Snr, Margaret Nicol currently a resident of Springfield Lakes. MEMORIES: Jan Christison sifts through the collection. "RUGBY League is everything to Ipswich," a gruff voiced Noel Kelly says as he reflects on the game's 100-year history in the mining town. This year marks the century of rugby league in Ipswich and the game will be celebrated with a photographic essay at the Ipswich Art Gallery next weekend which heavily features league legends like Kelly. The exhibition is being put together by Brassall league historians Bob and Jan Christison. The couple's photos bare no dust and date back to 1910, where smiles were rarer than Dud Beattie walking away from a fight. Beattie was part of the all-Ipswich Australian front-row in the late 1950's that featured fellow west Brisbane bruisers Noel Kelly and Gary Parcell who dominated the Bulimba Cup. Kelly is the archetype old-school footballer. He now lives in Sydney, but the former Goodna butcher still recalls his days in the Bulimba Cup playing for Brothers as some of his life's best. "It was a great time of my life, and the Bulimba Cup was a hard comp," he said. "Ipswich will always be league territory I think; the game has too proud a history in the city." The Queensland Times also played a large part in the success of league in Ipswich. One the best players in the early years of Ipswich rugby league was Charles Scott, who was also a QT reporter. Scott fought for his country in World War I. A decorated soldier, he made lieutenant in November 1917 but unfortunately died one week later. In the earlier years rugby league ran on the smell of hard work alone. Before sponsors and television revenue, Ipswich men like Gov Clark mortgaged their house to pay for the construction of North Ipswich Reserve. "It's actually easier to get hold of photos 80 years old than some of the ones taken this decade," Ms Christison said. "They either don't bother taking proper team photos in competitions in the IRL or they can't find them." You can view the results of the Christisons' hard work when the incredible exhibition runs at the Ipswich art Gallery on April 17 and 18. Ipswich is 150 years old today. all posts are currently displayed. The Ipswich Town Crier Mark Overell and the Ipswich Mayor Paul Pisasale swap hats as the city's sesquicentennial celebrations get into full swing. Ipswich was proclaimed a municipality by the Queensland Government 150 years ago today. 150 years ago today, Ipswich was proclaimed a municipality by the Queensland Government. It is a great day for Ipswich and Queensland. The Ipswich celebrations will continue all year. Vandals have damaged 19 tombstones at Goodna's historic, 150-year old cemetery in Stuart Street Goodna, causing an estimated $100,000 damage overnight. One of the damaged graves dates back more than 110 years. The Goodna Cemetery was established by the New South Wales government in 1859 before Queensland became a separate colony. Local Councillor and Cemetery Trustee Paul Tully described the vandalism as "a senseless destruction of family graves". "Whoever is responsible should face the full consequences of the law for this appalling desecration," Cr Tully said. Memories flooded back today for former residents of the Salvation Army Home for Boys at Riverview. It was a difficult time for many of the men who talked about their time at Riverview in the 1940s, 1950s and beyond. Time heals all and the honesty and openness of the former Boys' Home members and Salvationists at today's event was a milestone in the lives of all involved. Click "Home" below to see all posts on this website. If "Home" does not appear, all posts are currently displayed. The Customs receipts for the month show an increase of £339 3s. 10d. over those for the previous month. The totals were:- April, £1084 6s. 3d. ; May, £1423 10s. 1d. A youth named Harvey Tully, 17 years of age, was convicted at the Goodna Police Court yesterday on a charge of larceny from the dwelling of one James Harnell, and was fined 20s., or a week's imprisonment. Sergeant Atkinson, in consideration of the accused's youth, did not press for a heavy sentence, as a long term of imprisonment would mean his being sent to Brisbane Gaol, thus bringing him in contact with hardened criminals. The Southern Star football team visited Goodna this afternoon and played a match with a local fifteen on the Asylum Ground. The Ipswich club won by 9 points to 5. During the first half the game was mainly in favour of the Stars, for whom Hardie got a try. The second half was more evenly contested. A. Coogan secured a try for Goodna, from which P. Coogan kicked a goal, and Caskie scored two tries for the visitors. The Pioneers and a junior fifteen of the Grammar School met on the ground of the latter, and the Grammar School boys secured the victory by 9 points to 6. The tries for the School were obtained by I. Hill, E. Pender, and T. Taylor, and for the Pioneers C. Nolan and Jeffrey. No goals were kicked. Ipswich: Births, 23 males, 16 females, total 39; deaths, 10 males, 6 females, total 16. West Moreton: Births, 21 males, 27 females, total 43; deaths, 9 males, 5 females, total 14. There were 13 marriages registered for the town and 3 for West Moreton. Redbank Plains, Redbank and Collingwood Park. historical information on this site. MONDAY, 19th FEBRUARY, at 11 o'clock. POST OFFICE AUCTION MART, ADELAIDE STREET. Under Instructions from the Mortgagees exercising power of sale. effects of the old-established and well-known Royal Mail Hotel Goodna. This Hotel is situated on the Main Ipswich Road Goodna. Handy to Railway Station, on a corner position, in the business centre of the town of Goodna and comprises allotments 14 and 15 of Section 9, Town of Goodna, containing acre, 2 roods 1¼ perches, and allotments 5, 6, 7 and 8 of Section 6, Town of Goodna, containing 1 acre 1 rood 36 perches. Stock to be paid for in cash on valuation. 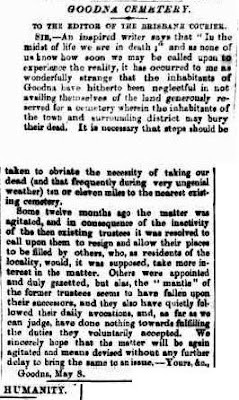 SIR, - An inspired writer says that "In the midst of life we are in death;" and as none of us know how soon we may be called upon to experience the reality, it has occurred to me as wonderfully strange that the inhabitants of Goodna have hitherto been neglectful in not availing themselves of the land generously reserved for a cemetery wherein the inhabitants of the town and surrounding district may bury their dead. It is necessary that steps should be taken to obviate the necessity of taking our dead (and that frequently during very ungenial weather) ten or eleven miles to the nearest existing cemetery. Some twelve months ago tho matter was agitated, and in consequence of the inactivity of the then existing trustees it was resolved to call upon them to resign and allow their places to be filled by others, who, as residents of the locality, would, it was supposed, take more interest in the matter. Others were appointed and duly gazetted, but alas, the "mantle" of the former trustees seems to have fallen upon their successors, and they also have quietly fol-lowed their daily avocations, and, as far as we can judge, have done nothing towards fulfilling the duties they voluntarily accepted. Alwyn Daye sustained severe burns on the body and arms when extinguishing a fire at the Goodna Memorial School of Arts on Saturday morning. 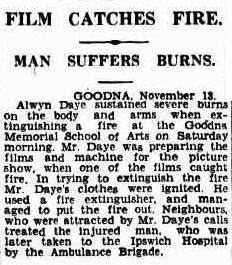 Mr. Daye was preparing the films and machine for the picture show, when one of the films caught fire. In trying to extinguish the fire Mr. Daye's clothes were ignited. He used a fire extinguisher, and managed to put the fire out. Neighbours, who were attracted by Mr. Daye's calls treated the injured man, who was later taken to the Ipswich Hospital by the Ambulance Brigade. A meeting was held at Goodna last night for the purpose of forming a Workers' Political Organisation, to work conjointly with the other organisations which had been formed in the district. Mr. Stevenson presided, and the hall was fairly well filled. After the chairman had explained the object of the meeting, which had been called by circular and not by the usual method of advertising in the newspapers circulating in the district. Mr. THOMAS GLASSEY, M.L.A., addressed the meeting for an hour and a-half. In the course of his speech he said he had been reading in that morning's Courier the statements made by the Premier at the opening of the Beaudesert show, and he would take the opportunity of challenging to some extent those statements. In referring to the shearers' strike Sir Samuel had said that he believed the people of the colony would endorse the action taken by the Government during the crisis. He (Mr. Glassey) maintained that the great bulk of the people did not support the policy of the Government on the occasion; and unless they retraced their stops, he would, when Parliament met, challenge them to dissolve it. He was opposed to the line of policy that the Government were at present pursuing. He would ask the electors when the time came, if they were favourable to tho Government, to elect someone also to represent them in his place, but if not, to again return him. They should ask the Government to give the people an opportunity to declare their opinions on the subject, and he personally would have no fear as to what would be the result. The Premier had said that the Government were not to take sides with either party, but to maintain law and order. He (the speaker) would be sorry to misjudge any man, particularly a man in such a high position as the Premier; but he could not help thinking that the verdict of the country, so far as it concerned the Government, would be one unfavourable to the course they had pursued; and he believed the people would be of his opinion, and that was that the Government had acted partially, and had taken sides with the capitalistic sect¡on of the community. Persons had been imprisoned without sufficient reason. He spoke also about the conditions of labour in England and in Australia, and laid great stress upon what he said was a fact that in many branches of labour in the colony females were asked to do the same work as males at one-half or one-third the rate of wages. He said that something of this sort had been seen at a place that had come under the notice of the labour commissioners in Ipswich. He referred to the matter of certain portions of the Press having sent representatives to write articles on such topics as the building trades, in order, he asserted, to show what a dreadful state of things had been brought about by the unionists. This was merely a capitalistic cry as hollow as it was loud. He concluded by hoping that better and brighter prospects were before the colony in the future. The chairman appealed to those present to join the organisation. He announced that a collection would be taken up to pay for the hall, and stated that any balance that remained after doing so would be added to the £3 gathered at Dinmore on the previous Saturday, and forwarded to the shearers. During the time the collection was being made Mr. M. PATTERSON moved, and Mr. J. WEBB seconded, - "That in the opinion of this meeting the time has fully arrived when the wage-earners should be more thoroughly represented in the Legislature, and with a view to carrying that object into effect a branch of the Workers' Political Organisation should be established in Goodna." Before the motion was proposed a considerable number of persons had left the hall, and on it being put to the meeting about a dozen hands were held up in favour of it, while none voting against it the resolution was declared carried. The CHAIRMAN then announced that the collection had amounted to 15s., and the proceedings terminated. HENRY Jorgensen and his mates used to tie their horses to a hitching rail and then run out for a game of footy for Goodna Rugby League Club. Henry's son Ray captained the club to its first A grade premiership in the traditionally tough Ipswich competition in 1969. These days, Ray Jorgensen, 64, delights in turning up to watch his grandsons play junior league in the club colours. Since 1912, there's been plenty of blood, sweat and bruises on Goodna's picturesque ground. Backing on to the Brisbane River and surrounded by jacaranda trees which are now in splendid bloom, Goodna is unashamedly a battling, blue-collar club. If rugby league is the working man's game, then Goodna typifies the game's heartland. Next Friday, Jorgensen and 200 others will celebrate the naming of the club's greatest team. One of Goodna's proudest sons, Noel "Ned" Kelly, will be there as captain of the side. "Ned played his early football here and then went to Ipswich Brothers where he went on to represent Australia," Jorgensen recalled. "He comes to all our dos and they named a street at the end of the oval after him. "Just as well Kelly is tough - it's going to be a busy day. After the Goodna lunch, (which usually extends way beyond sunset), he will go to a Brothers function where their "team of the century" will be announced. Jorgensen is also an ex-Brothers player, winning a premiership in 1967 and representing Ipswich in Bulimba Cup matches. "I got married and moved to Redbank," he said. "Once the Goodna blokes found out I was living locally they approached me to come down and help start their first A grade team in '68. "There were no hard feelings when I left Brothers, and coming here was the best move of my life. I've made lifelong friends. There's a real spirit here. "This is how it goes at Goodna - if someone's wife gets sick people phone up and send flowers. One of the blokes wants his ashes thrown on the field when he dies, another one has it written in his will that the Goodna song be sung at his funeral. "On game day there are probably 50 or 60 old Goodna players on the hill having a great afternoon. On Saturday mornings, a lot of us get there to watch our grandsons. It's a real family atmosphere." Jorgensen said some players signed by the club in the 1970s who had secured employment through officials or supporters were still working in the same jobs and raising families in the district. Several players from the 1968 inaugural premiership side have been named in Goodna's greatest team. Jorgensen has vivid memories of that season. 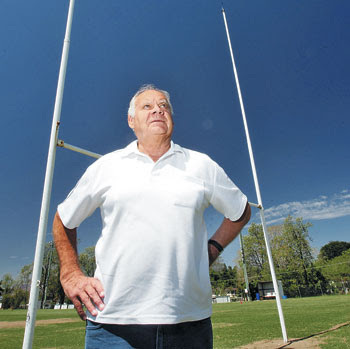 "Goodna had a lot of local talent and got Warren Beck from Brisbane Wests as coach in '69," he said. "We had the skills, but needed better conditioning and Warren introduced a different attitude to training. "We played RAAF in the grand final and they flew blokes in from all over Australia to play. They even had jets from Amberley do a flyover just before kick-off. It was a big occasion, but we won the match." The late Noel "Chips" Harrington, who later became a cult figure in Brisbane club football, played in the premiership side with fullback Max Henderson, who was on $2 a goal, centre Roy Kippen, five-eighth Ken Bretherton, second-rowers Rod Hoffmeister and Ron Daylight, and player-coach Beck - all members of Goodna's greatest team. Jorgensen coached the team in 1970 when the club lost key players to other clubs. "We had to rebuild and Eddie Maizey came in as coach and turned the club around," he said. "Eddie had a lot of new ideas and won premierships in 1973 and '74 as well a losing grand final in '75. He had a brilliant coaching career here." Although the club started in 1912, the greatest team has been selected from players since World War II because many early records were lost in the 1974 flood. The team is: Max Henderson; Frank Castles, Roy Kippen, Barry Rissman, Barry Butler; Ken Bretherton, Craig Wehrman; Noel "Chips" Harrington (dec'd), Noel Kelly, Ray Jorgensen, Rod Hoffmeister, Ron Daylight (dec'd), Harry Naylor. Reserves: Bill McKee (dec'd), Warren Beck, Steven Pierce, Jeff Johnson. The long-forgotten Goodna Racecourse - adjacent to what is now the Ipswich Motorway - closed for the last time in 1929. This popular racecourse was located opposite the Gailes Railway Station, immediately to the east of where the Logan Motorway is now situated. It was built on low lying land now occupied by Rocla Pipes. The Goodna Racecourse was a mecca for owners, trainers, jockeys, bookmakers, punters and underage gamblers who sought fame and fortune on the humble track at Goodna. It was fondly remembered by longtime Goodna resident Steve Davies who recalled his childhood memories in 2007 of this long forgotten racecourse. Steve Davies was born in Goodna in 1915 and has an encyclopedic knowledge of the early days of Goodna. His fascinating recollections provide a valuable, historic record of life in the town of Goodna during the past 100 years. Can you help with information on the historic Goodna Racecourse? We are searching for surviving pictures of the historic Goodna Racecourse. If you are aware of any pictures or other information about this important part of Goodna's history, please email Cr Paul Tully. Please email Cr Paul Tully with details for inclusion on this site.